I make the heaven and earth my parents. I make awareness my home. I make the tides of breathing my life and death. I make honesty my divine power. I make understanding my means. I make character my magic secret. I make endurance my body. I make the flash of lightning my eyes. I make sensibility my ears. I make promptness my limbs. I make “unshadowed by thought” my strategy. I make “seizing opportunity by the forelock” my design. I make right action my miracle. I make adaptability to all circumstances my principle. I make emptiness and fullness my tactics. I make ready wit my talent. I make my mind my friend. I make carelessness my enemy. I make benevolence and righteousness my armor. I make immovable mind my castle. I make absence of self my sword. 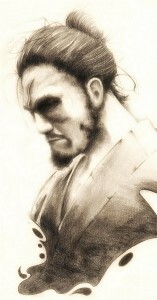 Samurai image courtesy of Rodolfo Carvalho at Atelier and DeviantArt with much gratitude.